Would you like to eat something that looks like a dirty garbage bag? I've got you covered. In seaweed. Like a sea monster. Preheat the oven to 250. 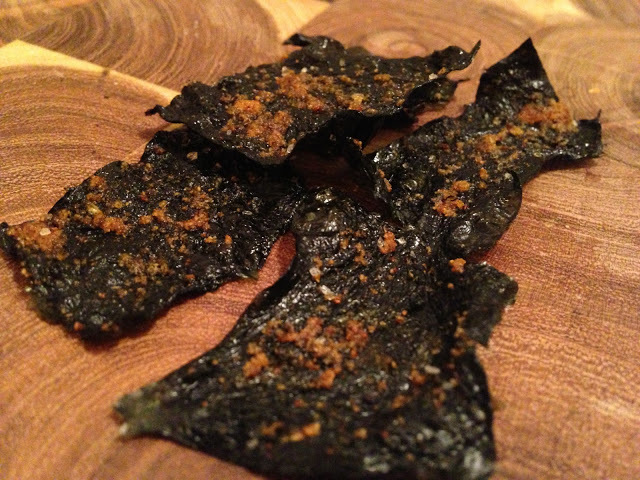 Lay out two sheets of nori on a foil-lined baking sheet. Spray or brush them lightly with water. Then press a second sheet on top of each and spray/brush them with water too. Press them together. Cut the sheets into strips with shears or a pizza cutter. Brush the sheets with sesame oil, sprinkle with garlic powder, chili powder and salt. Bake for 15-20 minutes, until the chips are dark and crisp. EAT.